Miao & WafuPafu Comic Blog » Its Monday already?! « Miao wanna Save Money! Posted on May 10, 2009 by Jian Akiraceo. This entry was posted in Announcement and tagged busy weekend, short wekeend, time passes, weekend passing like water. Bookmark the permalink. love your old one though. wpw.. love your new template… keep your blog going forever and forever!!! wow, when looking at previous time, i haven’t realized your blog had undergo through many changes! XD u r really geng 1! The new holiday mood is so holiday mood. Heart your blog a lot. I see super I see delicious..
this layout is extremely KAWAII. love the twitter!! Waw love the new look. Er, but miao are you going on a holiday ka? o.O? Liking this new theme,as cute as it ever be,kaka. 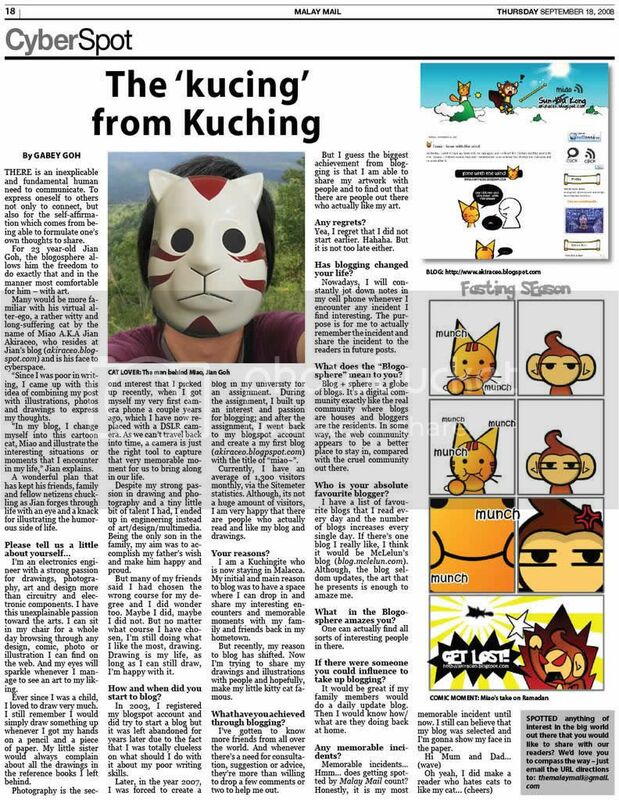 when i read ur blog is like i’m reading comic..looking 4ward for the next entry..
Wa, very nice layout leh! Nice job! I really should learn more from you. Nice theme. Try messing with your CSS file to make IE6 compatible. I love blue…love your new layout…summer is coming..yippie!!! OMG! Damn nice lar ur new layout. Eh there’s no fff in the content wrapper ar? The header is awesome. It blends the whole page really well. Keep it up! Haha I remembered someone request it early on..
Hahaha shh .. don’t say so loud..
very nice ler ur new template. Still waiting for ur new wallpaper. lol yes i understand that once u started on something, cannot stop. same goes to me when i try to decorate my own page by learning all those html etc.. haiz. but at least the result is good, the time and strength used wont feel wasted lor!! Yalor.. once started then can sit for hours non-stop..
but sometimes just need that strength to start XD hahaha to do something..
Miao open mouth big big and catchie. *sushissss dropping off from my hand* I’m viewing this from google chrome, effect not bad also. Hehe. Phew lucky Chrome doesnt have problem..